Okay, I will admit, I love cats. I love dogs. I can't imagine my home without at least one! The only thing about cats I don't like is that they are everywhere including counters and tables. So, for now, I have an awesome Sr. Orange Tabby that is too fat to be jumping up on things. We inherited Gerard and we're working on his diet but for now, he is to fat to fly. 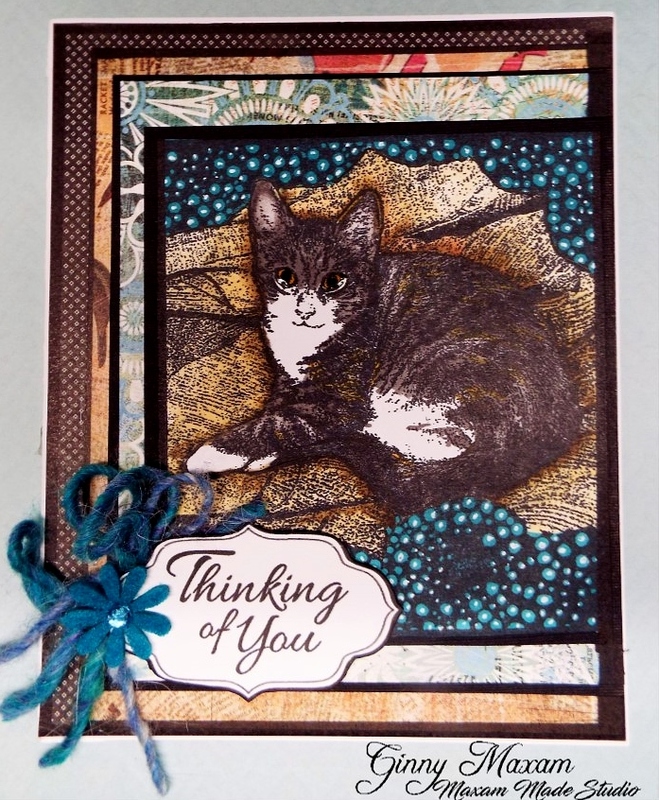 Magenta has a beautiful line of cat stamps and I own a lot of them and ( I might be a closet Crazy Cat Lady) I really enjoy making cat cards and sending them on to the sister CCL's. I am buying all my stamps unmounted now, I don't have room for any more wood mounted so the only time I buy one is if I run across one that is used or on a special. This brand new Cat Stamp 'Sweet Olivia' is cling mounted and ready to use in my stamping tool. I also stamped off a bunch of these 'Thinking of you' sentiments in a frame and then cut with my SNC machine. I'll store these with my precut sentiments - it is nice to have this kind of a stash. I used a lot of layers and a little bit of dimensional tape, This is going in today's mail and I wanted to make sure it is mailable. Do I sound like a broken record? Holding it all together; Best Glue Ever - perfectly flat layers! Thanks for stopping by, I hope you enjoyed this post!